Studio Address: Mohan Terracotta Art, Village & Post Molela,Via. Khamnor, Dist. 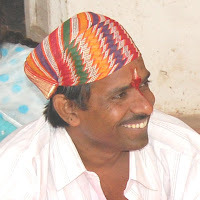 Rajsamand - 313322, India, . Telephone & Fax : 00 91 2953 285109 Email;dineshmolela@yahoo.co.in Availability: Studio is open from 9am to 7pm every day.Directions: My studio is located about 45 KM north of Udaipur,(India).Udaipur is well connected by Air, Rail and bus services from New Delhi & Mumbai, which are major cities of India. For fifteen generations dinesh chandra Kumhar's family have practised the tradition of making terracotta plaques of traditional Hindu Deities. Molela is known in the area as a 'potters village' as there are about 30 families from the Kumhar caste producing pottery. It produces a range of pottery goods , from devotional plaques to large panels depicting rural village scenes and smaller items such as temple hand bells and domestic ware. Work is available mainly from the village. Two local clays are used - Nada, a coarse black clay with a high sand grog and Alu, a finer gray clay used for throwing. The two clays are mixed together in equal parts with the addition of 20% dried and sifted donkey dung, which helps to disperse the heat through the plaque and lesson the thermal shock during firing. Dinesh wedges the clay with his feet, then kneads it by hand into a round ball ready for use. In the courtyard of his work shop he works on the floor, which has been dusted with dung. The clay is flattened and smoothed with a bevelled wooden tool into a slab 15cm thick. Dinesh chandra Kumhar's family has lived in the small town of Molela, fifty km. north of Udaipur in southern Rajasthan for the past 15 generations. Under the guidance of his father, Dinesh began his apprenticeship at the age of 10. He was born in 1969.He has visited many parts of the Country demonstrating and showing his work.His work is in many national collections in India and also Internationally. He father won the Nation Award (1988 - 1989) and Rajasthan State Award for Master Craftsmen 1983 - 1984 for terracotta. He has visited many parts of the world demonstrating and showing his work, including France(1991), Australia(1988), the USA (1986)and Span(2004).He has shown work at the Australia College of Advance Education, Australia and demonstrated at the Mangi International Museum La Jolla USA.